Jen Pleasants' gorgeous recycled gold and brass talisman evokes powerfully mystical ancient traditions. The mystical Third Eye. The Eye of Providence. The Evil Eye. Peepers sure occupy some powerful perches. Jen Pleasants' Ancient Eye Amulet Necklace embodies them all. 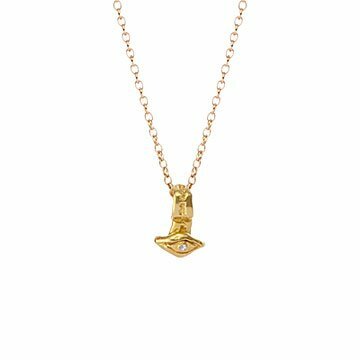 Evocative of talismans discovered in ancient archeological sites, it's made of 100% recycled brass and 14k gold, with a white topaz "eye." A little clairvoyant, possibly all-seeing, it could bring peace of mind, if you let it—and an ongoing reminder that kindness and truth are the best protections against bad juju. Handmade in Portola Valley, California. Pendant: .8" L x .5" W; Chain: 18"